The Tennessee Law Prohibits Discrimination in Employment is an equal opportunity law poster by the Tennessee Department Of Labor and Workforce Development. This is a mandatory posting for all employers in Tennessee, and businesses who fail to comply may be subject to fines or sanctions. This poster, written in English and Spanish, must be posted in a conspicuous place by all employers so that all employees can see it. This poster describes the rights of employees to not be discriminated against by any of the reasons listed on this poster. It appears you don't have a PDF plugin for this browser. 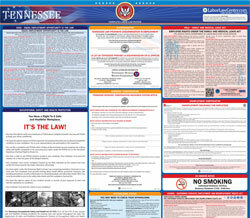 Please see the link below to download tennessee-website-employment-poster-2014-final.pdf. CONDITION,	 TERM	 OR	 PRIVILEGE	 OF	 EMPLOYMEN	T.
T	ennessee	 Human	 Rights	 Commission	. con	 la 	Co	m	is	ión	 de	 De	rech	o	s H	uman	o	s d	e	 T	enness	e	e.
Tennessee Human Rights Commission, Authorization no. 316148	, 0 copies. This document was promulgated at a cost of $0. 00 per copy.